Report Sharp Shooter-Flexible easy to use reporting. Report Sharp-Shooter is designed for the .NET Framework, written in C#, and contains only 100% managed code. Report Sharp Shooter provides the ability to generate reports of any complexity from multiple data sources and export the generated reports to most formats including PDF, HTML, EMF, BMP, JPG, GIF, TIFF, PNG, Excel, Excel (XML), CSV, TXT, and RTF. ...... Report Sharp-Shooter includes an end user designer which can be used for both report templates and rendered documents, you can also view the created reports in Windows or Web applications using the supplied viewers. 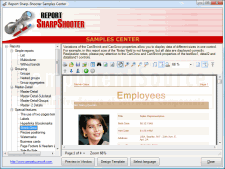 Report Sharp-Shooter Professional Edition is designed to be used in both Windows and Web applications, it provides the whole products functionality and delivers the full source code in C#. *New:Convenient preview during the selection of property values provides the ability to see the result of changes in the element immediately. Preview will be available for Font, FontSize, TextFill, Angle, Fill, Gallery of Styles, SizeMode, Line, Shadow, Label, BackColor and BarColor. *New:Quick access toolbar, which includes standard controls like save, undo, redo and so on. Qweas is providing links to Report Sharp Shooter 6.0.0 as a courtesy, and makes no representations regarding Report Sharp Shooter or any other applications or any information related thereto. Any questions, complaints or claims regarding this application Report Sharp Shooter 6.0.0 must be directed to the appropriate software vendor. You may click the publisher link of Report Sharp Shooter on the top of this page to get more details about the vendor.